Elijah Tuller was born on 2 February 1726 at Simsbury, Hartford Co., CT. He was the son of Jacob Tuller and Mary Moses. Elijah Tuller married Sarah Case, daughter of Jacob Case and Abigail Barber, in 1751. Elijah Tuller died on 7 February 1814 at Simsbury, Hartford Co., CT, at age 88. John Case was born at Simsbury, Hartford Co., CT. He was the son of Capt. John Case and Sarah Barber. Giles Case was born on 20 February 1747/48 at Simsbury, Hartford Co., CT. He was the son of Capt. John Case and Sarah Barber. Giles Case died on 5 February 1754 at age 5. Seth Case was born on 29 September 1749 at Simsbury, Hartford Co., CT. He was the son of Capt. John Case and Sarah Barber. Seth Case married Eunice Tuller, daughter of Joseph Tuller and Martha Bunce. Seth Case died on 4 June 1813 at OH at age 63. [S101] Ruth Cost Duncan, John Case, Page 45/Item 86. [S59] Ruth Cost Duncan, John Case, Page 45. Sarah Case was born on 27 July 1754. She was the daughter of Capt. John Case and Sarah Barber. Sarah Case married Elisha Cornish Jr., son of Elisha Cornish and Hepzibah Humphrey, on 12 April 1764. Sarah Case died on 20 August 1827 at age 73. Ruth Cost Duncan also cites the Simsbury First Church records. Children of Sarah Case and Elisha Cornish Jr.
Asa Case was born on 11 January 1753 or 14 1753 at Simsbury, Hartford Co., CT. He was the son of Capt. John Case and Sarah Barber. Asa Case died on 21 March 1830 at Simsbury, Hartford Co., CT.
[S101] Ruth Cost Duncan, John Case, Page 45/Item 87. Mary Case was born on 2 January 1755. She was the daughter of Capt. John Case and Sarah Barber. Mary Case married Silas Case, son of Amos Case and Mary Holcombe, in September 1780. Mary Case married Capt. Uriah Case, son of Sgt. Richard Case and Mercy Holcombe, on 27 December 1815. Mary Case died on 15 October 1833 at age 78. She was buried at Dyer Cemetery, Canton, Hartford Co., CT.
[S101] Ruth Cost Duncan, John Case, Page 20/Item 29.vi; Page 36/Item 65. Giles Case was born on 24 May 1757 at Simsbury, Hartford Co., CT. He was the son of Capt. John Case and Sarah Barber. Giles Case married Dorcas Humphrey, daughter of Benajah Humphrey and Caroline Humphrey.2 Giles Case died on 5 October 1837 at Howlett Hill, Onondaga Co., NY, at age 80. [S59] Ruth Cost Duncan, John Case, Page 46, Item 88. George Case died at OH. He was born on 4 March 1759 at Simsbury, Hartford Co., CT. He was the son of Capt. John Case and Sarah Barber. George Case married Electa Moore, daughter of Obadiah Moore and Abigail (? ), on 2 November 1783 at First Congregational Church, Simsbury, Hartford Co., CT.
[S101] Ruth Cost Duncan, John Case, Page 46/Item 89. Levi Case was born on 14 December 1760 at Simsbury, Hartford Co., CT. He was the son of Capt. John Case and Sarah Barber. Levi Case married Polly Humphrey, daughter of Hon. Daniel Humphrey and Rachel Phelps, on 10 March 1785 at Simsbury, Hartford Co., CT. Levi Case died on 23 April 1802 at Simsbury, Hartford Co., CT, at age 41. Judah Case was the son of Capt. John Case and Sarah Barber. Judah Case married Ruth Higley, daughter of Joseph Higley and Eunice Smith, in June 1787. [S101] Ruth Cost Duncan, John Case, Page 47/Item 91. Abigail Case was born on 28 November 1763 at Simsbury, Hartford Co., CT. She was the daughter of Capt. John Case and Sarah Barber. Abigail Case married Asa Hoskins, son of Daniel Hoskins and Abigail Case, on 6 November 1784. Abigail Case died on 25 March 1843 at Simsbury, Hartford Co., CT, at age 79. Silas Case was born on 28 December 1749 at Simsbury, Hartford Co., CT. He was the son of Amos Case and Mary Holcombe. Silas Case married Jane Leete, daughter of Samuel Leete and Jane Kelly. Silas Case married Mary Case, daughter of Capt. John Case and Sarah Barber, in September 1780. Silas Case died on 20 June 1809 at age 59. He was buried 06, 1809 at Dyer Cemetery, Canton, Hartford Co., CT.
[S101] Ruth Cost Duncan, John Case, Page 36/Item 65. Naomi Barber was born on 20 July 1743 at Windsor, Hartford Co., CT. She was the daughter of Daniel Barber and Naomi Barber. [S169] M.D. Donald S. Barber, Thomas Barber 1st Ed, Page 32. Daniel Barber was born on 8 November 1744 at Windsor, Hartford Co., CT. He was the son of Daniel Barber and Naomi Barber. Daniel Barber died on 22 August 1817 at North Greenwich, Washington Co., NY, at age 72. [S169] M.D. Donald S. Barber, Thomas Barber 1st Ed, Page 87/Item 83. Asa Hoskins was born on 4 October 1823. He married Nancy Rachel Holcombe, daughter of Hull Holcombe and Lorinda Buell, on 19 October 1846. Asa Hoskins married Lucy A. Alford. Asa Hoskins died on 17 October 1884 at age 61. Rev. Allen McLean witnessed the marriage of Nancy Rachel Holcombe and Asa Hoskins on 19 October 1846. 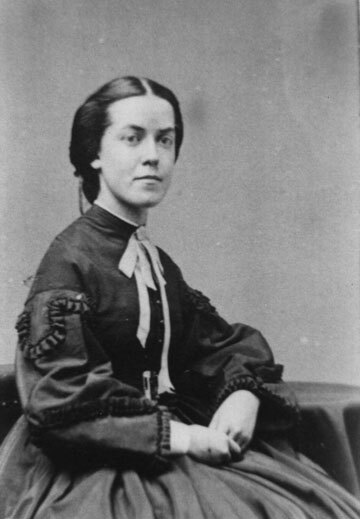 Lucy A. Alford was born on 14 January 1835. She married Asa Hoskins. Lucy A. Alford died on 2 December 1904 at age 69. John Asa Hoskins was born on 16 December 1847. He was the son of Asa Hoskins and Nancy Rachel Holcombe. John Asa Hoskins died on 17 February 1851 at age 3. He was buried at Center Cemetery, Simsbury, Hartford Co., CT.
Abigail Jane Hoskins was born on 6 September 1850 at Simsbury, Hartford Co., CT. She was the daughter of Asa Hoskins and Nancy Rachel Holcombe. Abigail Jane Hoskins married Alfred Chesbro, son of Curtis Hart Case and Eliza Hoskins, on 6 January 1875 at Simsbury, Hartford Co., CT. Abigail Jane Hoskins died on 12 May 1929 at Bloomfield, Hartford Co., CT, at age 78. Simsbury, Oct. 10. Edmund A. Hoskins, prominent farmer and tobacco grower, died at his home early this morning after sevral months' illness. He was born in Simsbury December 11, 1851, the son of Asa and Nancy Holcomb Hoskins, and had lived here all his life. He had twice represented the town in the State Legislature, and had been chairman of the Republican Town Committee for more than 30 years. He leaves one brother, Frederick C. Hoskins of Simsbury, and one sister, Mrs. Abigail Hoskins Case of Bloomfield. Funeral services will be held at his home Sunday at 2:30 p.m. Rev. Edwin Knox Mitchell will officiate, and the bearers will be Frank Healy of Windsor Locks, A. T. Pattison, George E. Pattison, Harry N. Curtiss, Joseph R. Whitehead and Harry P. Eno, all of Simsbury. [S284] Courant, 20 October 1928. Mary Elizabeth Hoskins was born on 12 August 1853. She was the daughter of Asa Hoskins and Nancy Rachel Holcombe. [S97] Seth P. Holcombe, Descendants of Hull Holcomb, Page 9/Item 12. Frederick Chauncey Hoskins was born on 10 June 1855 at Granby, Hartford Co., CT. He was the son of Asa Hoskins and Nancy Rachel Holcombe. Frederick Chauncey Hoskins died on 25 January 1933 at Simsbury, Hartford Co., CT, at age 77. He was buried on 28 January 1933 at Center Cemetery, Simsbury, Hartford Co., CT.
Frederick C. Hoskins, 77, retired farmer and a member of one of the oldest families in Simsbury, died Wednesday night at this home in the Hoskins district, which was named after his family. He was born in Simsbury June 18, 1855, the son of Asa and Nancy (Holcomb) Hoskins, and had lived in Simsbury all his life. He leaves a half-brother, Burton Hoskins of Mt. Carmel and several nieces and nephews. He was prominent in all town affairs and served on various town boards. He was a member of the lower house of the Legislature in 1911. He was a member of St. Mark’s Lodge, A.F. and A. M., of Simsbury. Funeral services will be held at his home Saturday at 2 p.m. Burial will be in the Simsbury Cemetery. Child Holcombe was born on 10 May 1845 at Granby, Hartford Co., CT. She was the daughter of Chauncey Holcombe and Polly Holcombe. Child Holcombe died on 13 June 1845. [S104] DAR DAR Lineage book, Vol. LIX:Pg 201/Item 58587. Ermina A. Cutler was born at Granby, Hartford Co., CT. She was the daughter of Dr. Cecil Cutler and Isadore P. Holcombe. Henrietta Isadore Lee was born on 13 March 1867. She was the daughter of Richard Henry Lee and Mary Elizabeth Holcombe. [S164] Carol Laun, Holcombe Collection, Page 83. Albert Henry Nye was born on 28 March 1858 at "Missing Place" no. 6209. He was the son of Lewis Clark Nye and Melinda Cook. Albert Henry Nye married Harriet Cornelia Holcombe, daughter of Edmund Buell Hull Holcombe and Angeline Sophia Oatley, on 3 June 1885 at Granby, Hartford Co., CT. Albert Henry Nye died on 28 September 1935 at age 77. Angeline Dolly Nye was born on 9 October 1886. She was the daughter of Albert Henry Nye and Harriet Cornelia Holcombe. Angeline Dolly Nye died on 4 January 1888 at age 1. Lyman Lewis Nye was born on 16 October 1889. He was the son of Albert Henry Nye and Harriet Cornelia Holcombe. Lyman Lewis Nye died on 20 May 1890. Edmund Russell Nye was born on 3 November 1891 at Blandford, MA. He was the son of Albert Henry Nye and Harriet Cornelia Holcombe. Edmund Russell Nye married Anna Choufett, daughter of Charles Chouffett and Alice (? ), on 15 June 1921. [S97] Seth P. Holcombe, Descendants of Hull Holcomb, Page 13/Item 23. Marion Melinda Nye was born on 10 February 1898 at Blandford, MA. She was the daughter of Albert Henry Nye and Harriet Cornelia Holcombe. Marion Melinda Nye married John Warren Peebles, son of John Peebles and Nettie Church, on 28 November 1918. [S97] Seth P. Holcombe, Descendants of Hull Holcomb, Page 13/Item 24. Gladys Mabel Nye was born on 26 November 1902 at Blandford, MA. She was the daughter of Albert Henry Nye and Harriet Cornelia Holcombe. Gladys Mabel Nye married Walter Eaton Allen, son of George H. Allen and Alice Ellen Pendleton, on 7 May 1922. [S97] Seth P. Holcombe, Descendants of Hull Holcomb, Page 14/Item 25. Donald Oatley Nye was born on 17 August 1908. He was the son of Albert Henry Nye and Harriet Cornelia Holcombe. Donald Oatley Nye married Eleda Irene Bodurtha, daughter of Warren S. Bodurtha and Minnie Wyman, on 7 April 1928. [S97] Seth P. Holcombe, Descendants of Hull Holcomb, Page 14/Item 26. Alfred Chesbro was born on 25 July 1848 at Bloomfield, Hartford Co., CT.3 He was the son of Curtis Hart Case and Eliza Hoskins. Alfred Chesbro was also known as Alfred Chesbro Case. He married Abigail Jane Hoskins, daughter of Asa Hoskins and Nancy Rachel Holcombe, on 6 January 1875 at Simsbury, Hartford Co., CT. Alfred Chesbro died on 7 November 1923 at Bloomfield, Hartford Co., CT, at age 75.3 He was buried at Mt. View Cemetery, Bloomfield, Hartford Co., CT.3 Seth says he died in 1912, Ruth says he died in 1923. [S101] Ruth Cost Duncan, John Case, Page 184/Item 580. [S97] Seth P. Holcombe, Descendants of Hull Holcomb, Page 9/Item 10. [S807] Find A Grave, online http://www.findagrave.com, Find A Grave, database and images (https://www.findagrave.com : accessed 14 March 2019), memorial page for Alfred Chesbro Case (25 Jul 1848–7 Nov 1923), Find A Grave Memorial no. 83994930, citing Mountain View Cemetery, Bloomfield, Hartford County, Connecticut, USA ; Maintained by M Cooley (contributor 47154454) . [S101] Ruth Cost Duncan, John Case, Page 164/Item 487. [S807] Find A Grave, online http://www.findagrave.com, Find A Grave, database and images (https://www.findagrave.com : accessed 14 March 2019), memorial page for Curtis Hart Case (7 Apr 1823–16 Feb 1903), Find A Grave Memorial no. 83994879, citing Mountain View Cemetery, Bloomfield, Hartford County, Connecticut, USA ; Maintained by M Cooley (contributor 47154454) . Eliza Hoskins was born on 17 May 1821 at Simsbury, Hartford Co., CT. She was the daughter of Noah Hoskins and Phillis Thompson. Eliza Hoskins married Curtis Hart Case, son of Hezekiah Hart Case and Roasbella Pinney, on 10 June 1851 at First Congregational Church, Simsbury, Hartford Co., CT. Eliza Hoskins died on 16 May 1904 at Bloomfield, Hartford Co., CT, at age 82. Elva Maria Case was born on 4 May 1851. She was the daughter of Curtis Hart Case and Eliza Hoskins. Hezekiah Hart Case was born on 7 November 1795 at Simsbury, Hartford Co., CT. He was the son of Hezekiah Case and Cynthia Eno. Hezekiah Hart Case married Roasbella Pinney, daughter of Rosabella Adams, on 21 January 1822 at Simsbury, Hartford Co., CT. Hezekiah Hart Case died on 29 May 1876 at Bloomfield, Hartford Co., CT, at age 80. [S101] Ruth Cost Duncan, John Case, Page 128/Item 348. Roasbella Pinney was born on 4 May 1800 at Simsbury, Hartford Co., CT. She was the daughter of Rosabella Adams. Roasbella Pinney married Hezekiah Hart Case, son of Hezekiah Case and Cynthia Eno, on 21 January 1822 at Simsbury, Hartford Co., CT. Roasbella Pinney died on 15 May 1864 at Bloomfield, Hartford Co., CT, at age 64.